Have you ever come home and been stopped dead in your tracks upon finding that your dog has ravaged a piece of furniture, your favorite shoes, a rug, or even his own bed? Don’t get angry, get proactive! Inappropriate chewing is easily curtailed if you take preventive measures. Puppies need to chew when they’re teething, similar to the way human babies do. It’s also a way for dogs to investigate unfamiliar objects in their environment. A Dog’s need to chew is natural and instinctual; one of the reasons for chewing was to keep a dog’s jaws strong and clean their teeth and gums. The urge to chew doesn’t end when your dog becomes an adult, it continues throughout his life. 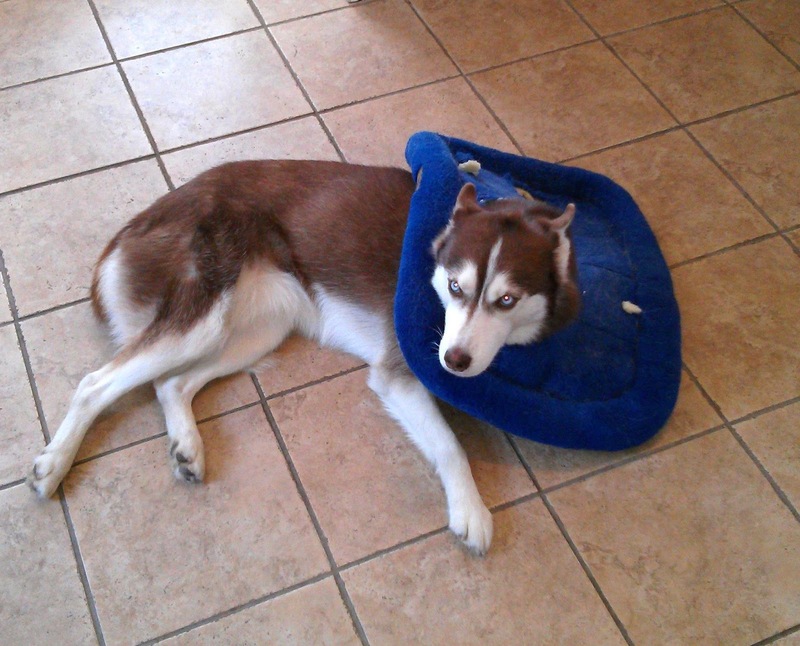 Isis did the Walk of Shame after ripping up poor Phoebe's bed. I neglected to spray it with Bitter Apple spray; shame on Mommy. There’s good chewing and there’s bad chewing. Bad chewing is when your dog chews inappropriately and destructively. There are several reasons for destructive chewing. BOREDOM: Your dog may simply be bored. He doesn’t have enough things to keep him occupied at home. EXCESS ENERGY: Your dog may not have burned enough energy through physical activity. He needs to release that pent up energy somehow and your couch might end up being just the thing! 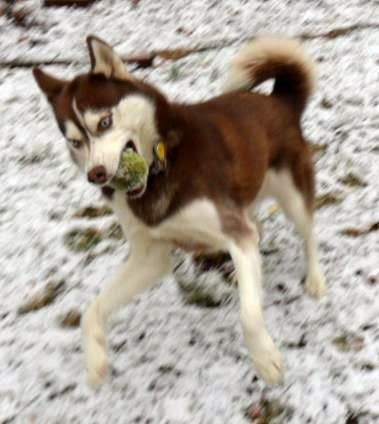 My Snowdog gets even more energetic as the weather cools down! ANXIETY: If your dog is anxious; separation anxiety or is just general anxiety, he needs to find a way to relieve his anxiety. Attacking your shoes in a frenzy may be the only way he knows to get relief! STRESS: Your dog may become stressed by changes in the household. This can be anything from work being done in the house, guests staying over, moving, a new baby or pet joining the family, or anything else that is out of the ordinary. He may not understand what’s happening or what to expect next and that could stress him out. EXERCISE: If I’ve said it once, I’ve said it a thousand times; A WELL EXERCISED DOG IS A GOOD DOG! Keep your dog well exercised with daily walks; quick potty walks are not enough. Take him for longer interesting walks that burn energy and include lots of interesting smells. Vary your route to keep it interesting. Hikes or bike rides are even better. PLAY DATES: Arrange play dates with one or two other dogs a few days a week. 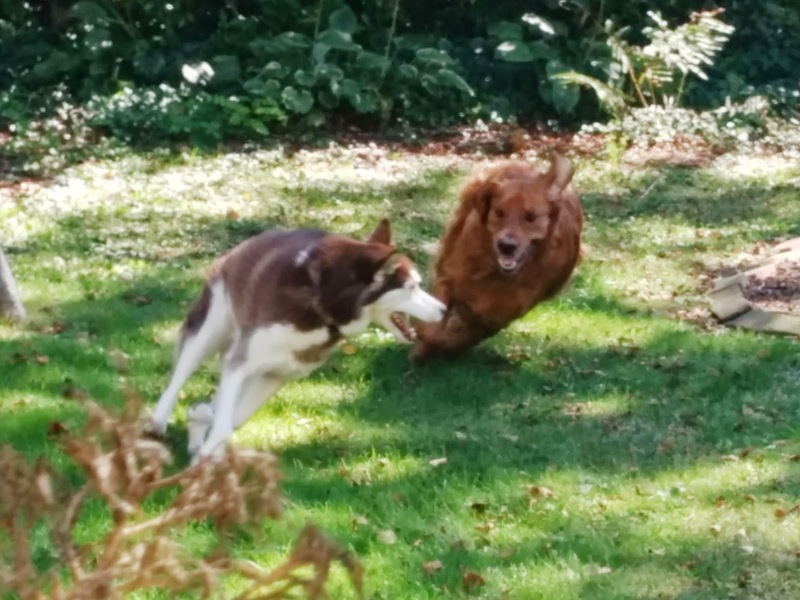 Dogs playing will go at it until they plop down with exhaustion! When I invite Isis’ Golden Retriever friend Cooper over for playtime in our yard, I know I’ll have a seriously tired dog afterwards. That’s saying a lot considering how much energy a Husky has! Isis plays hard with her "boyfriend" Cooper! DOG PARKS: Take your dog to a dog park. If you work, go early morning or late evening before dark. The dog park is both mentally and physically stimulating. So many dogs to sniff and play with! It’s like a play date times ten. DOGGIE DAYCAMP: On days when we need Isis to really burn energy but we don’t have the time – or the stamina – to exercise her we bring her to doggie daycamp. Doggie daycamp is like a controlled dog park activity that lasts all day. When my husband and I were both working full time putting in long hours, we took Isis to doggie daycamp 2 or 3 times a week. One of us would drop her off at 7am on the way to work and pick her up before they closed in the evening. It’s a great convenience. Isis plays hard in daycamp. When we pick her up, she's content and dead dog tired! TOYS: Make sure your dog has toys that will keep him occupied throughout the day. Rotating toys will keep them fresh in your dog’s mind and will be more exciting each time he gets to play with them. I keep the toy basket out of reach and out of sight. I randomly give them 2 or 3 to play with at a time. They get excited each time they see their “new” toy again! Interactive toys will keep your dog mentally stimulated. A Wobbler toy filled with some kibble or treats, or a puzzle toy are good choices. BITTER SPRAY: Bitter spray is your friend! You can spritz it on furniture and other objects your dog may have taken a liking to. The day I brought Phoebe home I was horrified to glimpse her putting her mouth on the rungs of my dining room chair to have a chew. I gave her a firm “Ah, Ah! !”, but she kept going back to the chair. I broke out my trusty Bitter Apple spray and proceeded to hose down each and every chair leg in the house! I also sprayed around the couch and pillows. Bitter spray has been a savior in our home. When Isis was a puppy I went through tons of it. I’ve even sprayed shrubs and plants I didn’t want the dogs to snack on. Keep up the spraying for a few days and your dog will quickly realized that the item he so desired to chew on now tastes disgusting! Has your dog ever eaten the couch, your shoes or other object? How did you handle it? I'VE JUMPED IN TO JOIN THE TUESDAY TAILS BLOG HOP!! I decided to trust Brychwyn out of his crate too soon and came home to find he had played tug with an upholstered chair. I can't believe the mess he made in 20 minutes! But if I had taken 20 minutes to exercise him before I left and given him a fun toy to play with in his crate, I wouldn't have had to spend 40 minutes cleaning up the mess and $400 reupholstering the chair! GASP!! Oh, the horror! Exercise is the key to happiness with dogs, after that comes busy toys! My condolences on your chair. Thanks for stopping by and sharing your story! We trusted Bentley too soon and he ripped up a huge section of our carpet and shredded the foam. We were gone about fifteen minutes! haha! I've used lots of Bitter Apple spray in all my puppy phases. BOL! Oh no! What is it about textiles that dogs find so attractive?! I hope you were able to repair that section of the carpet & foam. Bitter Apple spray is definitely a friend! Thanks for stopping by & sharing your carpet story. I have actually been stunned lately. 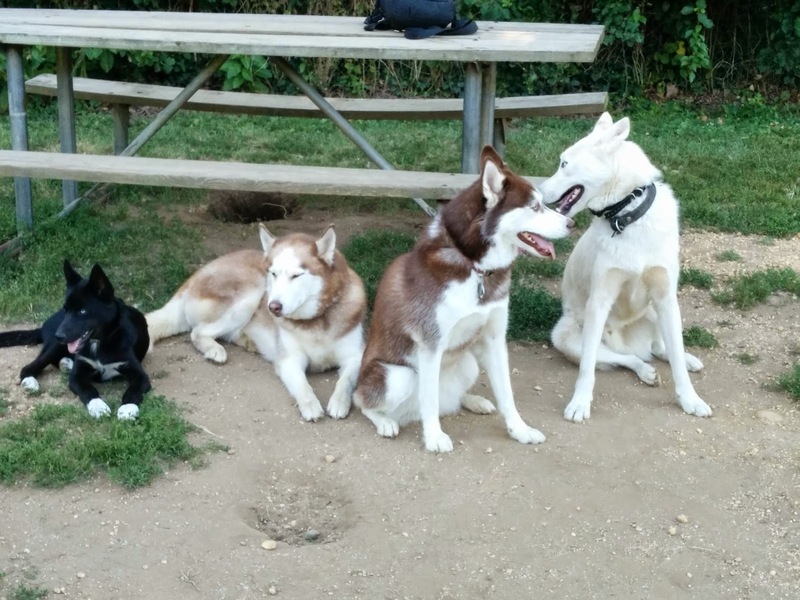 Each of my huskies, I have crate trained when they were younger, but they have all had the run of the house for quite some time now. Lately, when we leave, Koda has began to destroy things! Things on the counter....got into his dog food, somehow manages to break into a closed garbage container....not sure why all the sudden he is doing this! UGH! Oh wow, Koda must be going through something - maybe subtle changes in the household, a new neighbor? You never know w/ our sensitive Sibes! Recently a visit from a relative she loves set Isis off and she ripped up a blanket in the guestroom - so bizarre! Break out the bitter spray! Thanks for stopping by today, Jenna! Back when I was a stupid, newbie dog person, my two dogs chewed up two couches, the kitchen floor, and a bunch of very expensive cookbooks. I certainly know better now. But it's easier with some dogs than with others. My current foster puppy does not have a strong urge to chew. But my golden retriever, as a puppy, was a terror. It's a great idea to take some of your suggestions and match them to your dog. OMD, 2 couches and the floor?? What a nightmare! Good point about trying out different solutions & matching them to your individual dog. Thanks for that tip & for stopping by the blog today, Pamela! My Dogs' BLACK FRIDAY Shopping Spree! UPDATE: Long Term Shelter Dogs Finally Adopted!